NOTE: I wrote this two years ago. Unfortunately, ST Communities seems to have disappeared, so I thought I’d archive this piece here for post-terity (hur hur). Growing up, you referred to it as “hex” or “the pound sign”. Now, you refer to it as “hash” or “the number sign” – correctly, you think, with a sigh of relief. End of story? Think again, folks – this thing with two pairs of parallel lines intersecting each other has had a new lease of life breathed into it, and is gaining popularity with each passing day. “What? That’s ridiculous!” – what some of you might probably exclaim. #pfft #parents #lame – what your kids will probably say in eye-rolling response, replete with a weird finger action where they cross the index and middle fingers of both hands. Don’t call in the exorcist just yet, though – much as you might be inclined to disagree, the kids are all right; they’re just hashtagging. The hashtag, as it has come to be known, was first developed on Twitter for use as a means of indexing and retrieving topics. An example: Searching for #NLB or #NLBsaga on the micro-blogging platform allows you to easily locate stories on the recent pulping furore. The explosion of the hashtag’s usefulness and popularity on Twitter has influenced other social networking sites like Facebook and Instagram to adopt hashtags too. Here’s the twist – hashtag usage has evolved to encompass what linguist Ben Zimmer calls “ironic metadata”: light-hearted humour in which users subtly poke fun at themselves or others. 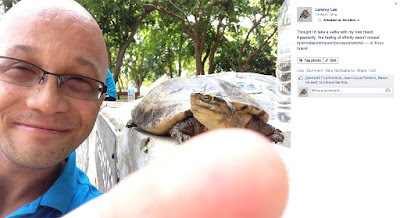 Through its succinct depiction of the turtle’s imagined response to being forcibly taken out of its enclosure for the snapping of a frivolous selfie. End of story? Not yet! Hashtag usage has become so popular online that people – including your children, much as you might be inclined to disagree with regard to their classification as humans – have been using it offline as well. Hence, the weird finger action they’ve been doing, and your alarm at the possibility of them being possessed. So don’t worry about the kids. Much like the hash symbol, your young’uns will morph and grow in strange and varied ways, but they’ll eventually find some function in life, useful or otherwise. Last but not least, should you join in the fun of physical hashtagging? My advice is a firm and solid “No”, lest your kids think you possessed too. Even land must lie fallow, from time to time, if it is to continue to produce life.